Category: Hola America! The family go USA! Well, we set off bright and early on a wet and windy morning. Jessica, Sophie, Marianne and I piled into a big taxi and rode out to the airport. The girls were very excited because it was their first ride in a taxi. We spent a short time at the airport and then jumped onto an enormous plane for the ride to Sydney. The flight was exciting and lots of fun. We had a window seat so the girls could look down on the clouds and the fields. Sophie asked if it was a map she was seeing, and was really excited to find out it was real! We arrived in Sydney and drove out to Garth and Anna’s house while rain, lightning and hail poured down. Their home was cozy and warm, the perfect place to end the day. After dinner and bath for the girls – who had a great time playing with Thomas and Edward (Jess LOVED their drums) – we sent them all off to bed so we could have grownups dinner. It was Jess and Sophie’s first night sleeping away from home, so they had some trouble sleeping. 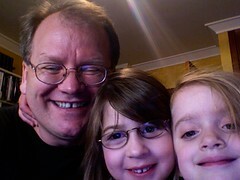 In the end – after a great evening – the girls ended up sleeping with me. In the morning we had breakfast, and then strolled down through Bronte towards the beach. Not long after we took a taxi out to the airport, to find out that the plane was delayed by ten hours. We’ve spent today in and around a hotel. In about four hours we head back to the airport and on to the plane for the big trip. Sophie’s fast asleep right now. Well, here we go. In about two and a half hours a taxi will pull up in front of the house and we will begin the big trip of 2006. I’m going to start here by confessing that I don’t want to go (I doan wanna, I doan wanna, I doan wanna!!). This is mostly because what I think I really need is a week or two of isolation, or maybe going somewhere quiet down South near the beach where I can do nothing much for a while. Every trip for the past six years or so has been terrific, but they’ve all been busy, busy, busy. I’d like to relax. That extended whine out of the way, I think this should be a great trip. We’re visiting a lot of friends, some we haven’t seen in two long, and there’ll be CHARLES, Locus, WorldCon and a lot, lot more. It should be terrific fun. I’m also excited to be taking the girls to see something new and exciting when they’re at an age when everything’s new and exciting. If I can exert any self-discipline at all, I’ll be posting photographs from the trip here to the blog, and will be added blog comments etc etc from Jessie and Sophie. We’re hoping that the girls classes will be able to check in here and see what they’re friends are up to (hi kids!). To keep track of the trip report stuff, you can either read the main page of the blog or check out the ‘Hola America‘ category. It’s named that because when I went to the US in 1993 with some friends we made up tour t-shirts listing where we were going etc, just like for a rock band. We named the tour the ‘Evil Empire’ tour. No one, and I mean no one, we met in the US guessed who the Evil Empire was. I considered going with Evil Empire 2006 for this trip, but then reconsidered when I realised that everyone on this trip would know who it referred to. So, in honor of the girls watching Dora the Explorer, we get ‘Hola America‘. More soon. This is a second one of those photos – me, Jess, and Sophie. It was fun. This also tests a new post layout. Slowly, inexorably, the focus of this not terribly often updated blog is going to turn towards the upcoming trip to the US. The family and I leave nice cool wintry Perth on Tuesday 15 August and head East. We’ll be stopping in Sydney for a night, staying at with Garth and Anna, and getting to spend some time with the whole family for the first time (which should be way cool). We then fly on to San Francisco. We’ve done a car rental thing, and are crashing with still more friends. This should be fun too, because we never really get to see both AARon and Kirsten much, though sadly their daughter will be off Disney-ing. Marianne and the girls will only be in SF for three days, leaving Saturday, so we’ll be seeing CHARLES, heading up to LocusHQ, and catching up with as many of Marianne’s friends as possible. My suspicion is that we will go here at least once. When Marianne and the girls fly off I’ll be heading up to stay at LocusHQ for some guy-time with CHARLES. Much work will be done, serious conversation about science fiction and the future of Locus, maybe some scotch, cd shopping, gadget one-upmanship, and a good meal or two. Should be fun. I’m definitely hoping to catch up with Karen and Bob and Jeremy and Jason while I’m in Oakland. And then on Tuesday 22 August we all fly down to LA for this. We’ll be staying here, which is pretty much across the road from this. I’m doing some kind of panel stuff, but I don’t know what yet. Mainly, I’m going to be sharing a room with the other Musketeers, inducting a new member into the International Society of Manly Men Drinking Little Pink Drinks, and seeing as many friends as possible. I fear the number of books I will be carrying away from that place. Once the convention’s all done, I fly out for New York on Monday 28 August. I’m not sure of the exact timing of the next chunk of the trip, but it goes something like this. Spend a few days in Staten Island, go up to the Catskills with the family for a few days (maybe a week, I don’t know), then back to Staten Island, then over to Manhattan for a few days (we’ve got a hotel there), then back to Staten Island for Marianne’s birthday. Then, on Sunday 10 September we begin the horror run home, doing Newark – LA – Sydney – Perth pretty much non-stop, getting home on Tuesday 12 September sometime around noon. I will post contact details here as soon as I have them. We’re going to work something out about mobile phones for when we’re in the US, and I’ll have the laptop with me so email should be a pretty much constantly reliable way of getting in touch. Certainly, I need to work the whole time, or I’ll fall impossibly far behind on things. Normally I’d plan to work on the plane, but I’m not sure that’ll work with the girls there. I’m hoping to get a good chunk of reading done on the east coast of the US, which will mean I need to get the writing stuff done before then, which mostly means the intro to The New Space Opera (we’ve pretty much finished The Vance Treasury).